Greetings from Cape Town! We rejoice in the death and resurrection of our Lord Jesus Christ, who died for our sins so that we could have eternal life by faith in him. We remember the words of the angels to the women who went to Jesus’ tomb on the first resurrection Sunday, “He is not here, he has risen!” (Luke 24:6). Thanks be to God for his indescribable gift! In light of what God has done for us in Christ, we also give thanks to those of you who have shown God’s love to us by praying for us and by giving to support our ministry in South Africa. God has always been faithful in providing for our needs through your generous giving. The South Africa academic calendar consists of two semesters, with each semester divided into two terms. We reached the end of the first term in the middle of March. The past term went smoothly for the most part, although with some of the usual challenges for some students. For example, after an emotional meeting on the last day of the term, one of our residential students decided to suspend her studies for family-related reasons. I’ve also spent time meeting and praying with several staff members who are going through difficult personal and family issues. I was also able to take our academic administrative staff out for lunch in thanks for their hard work over the past term. This week we are still on a mid-semester break. I am planning to use this time to catch up on things left over from last term, and to prepare for next term. Starting next week I will be teaching Eschatology, the doctrine of last things. We will be discussing topics such as death, the intermediate state, immortality of the soul, the second coming of Jesus, millennium views, resurrection, final judgement, and the final state. Please pray for wisdom as I prepare, since I am more comfortable teaching Biblical Studies (NT and Greek, OT and Hebrew) rather than Systematic Theology. But I am up for the challenge! The Christian Leadership Programme (CLP) is a three year part-time vocational programme for church leaders. Most of our CLP students are already serving as pastors, elders, or even bishops. The Distance Learning Programme (DLP) is for university level programmes taught by distance. Since we arrived in South Africa at the end of 2016, I have personally interviewed all of our incoming DLP students. Nearly all of these students are mature in their faith and have been involved in ministry for some time. The residential programme is also for university level programmes. In recent years we have noticed that incoming residential students are increasingly younger with less ministry experience than in the past. Residential students are expected to be actively serving in ministry throughout the academic year their time at the Bible Institute. As you can see, our CLP and DLP students are generally more experienced and active in ministry than our residential students. That is why ministry week is so important for our residential students, since it gives them a concentrated time of supervised ministry experience each year. This year my fellowship group spent the week in Hermanus. My students ministered at Christ Church Hermanus and its daughter church, Christ Church Zwelihle. We stayed together at the house of a former Anglican bishop. This allowed us to bond as a group, and also gave me opportunity to meet and pray with students individually to prepare them before their various ministry tasks and to debrief afterwards. Every morning we met to pray and prepare for the day, and I led the students through a study of 2 Timothy. The week started on a difficult note. We had agreed to meet on campus at 10 AM to drive to Hermanus together. However, one of my students made a poor personal choice and ended up delaying our departure by several hours. Since he was still not available, I made the difficult decision to leave him behind. This created quite a number of logistical problems, especially since he was supposed to be driving one of our vehicles. We also had to reallocate all of his ministry assignments. Another setback came on Thursday afternoon when one of my married students needed to return to Cape Town to be with his young daughter, who ended up spending the night in the hospital. But she was doing much better after this, and my student rejoined us on Saturday. That was a good thing, since he was scheduled to preach both sermons at Christ Church Hermanus on Sunday morning! On Friday evening we were scheduled to lead a youth programme in Zwelihle (a black township in the middle Hermanus), but protests over land had erupted that prevented us from entering the township. The riots lasted for several days but have since settled down. Despite these setbacks, our time of ministry in Hermanus was amazing. The church embraced ourteam with open arms, and provided more than enough food, even for eight hungry students (and me)! We were given opportunities to lead Bible studies, for adults, youth, children, and women, in large and small groups, mainly in English but also in Xhosa and Shona. The first year students shared their testimonies in school groups and church groups. We also spent some time sharing the gospel with people in town. 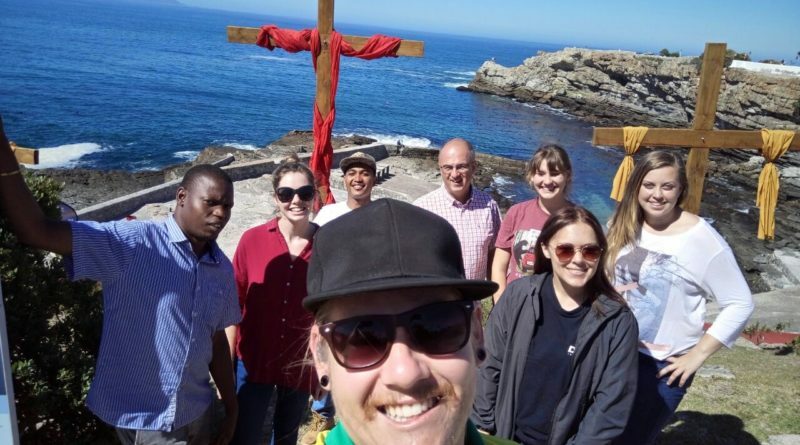 On Sunday morning, the students lead worship, shared testimonies, preached, and taught the Sunday School for both services at Christ Church Hermanus as well as preaching at Christ Church Zwelihle. One student in particular struggled in sharing his testimony to a group of high school students. I knew his testimony well (he had even shared it during his interview before he came to BI), and I knew he was gifted and articulate, but he didn’t do well when given the opportunity to share in from of a large group. From this I could see that he needed help focusing his thoughts, but I also sensed that there was a deeper spiritual issue. I decided to give him another opportunity to share his testimony during the main Sunday morning service, and met with him many times as he prepared to share. I believe God did a work in his heart during this time, not only because he did such a brilliant job of sharing his testimony on Sunday morning, but because I witnessed the hours of preparation he spent wrestling with his own thoughts and emotions in trying to understand how God was at work in his life. This was just one of the many ways we saw God at work during our time in Hermanus. Please pray that God will continue apply the lessons of ministry week in the lives of my students as they resume their studies at BI next week. As we mentioned in last month’s newsletter, we are now about $700 per month short of our ongoing budget. Please pray that God will raise up supporters to meet this need. We also expect a significant one-time shortfall in our ministry account. Most of this is due to medical expenses that was deferred while we lived in Zambia. Sarah has needed serious orthodontic work which we began before moving to Zambia in 2012 but had to delay until recently. My own glasses require prescription lenses that are quite complicated. I put off getting new lenses for years until now, since the old ones had become unbearable. In addition, I am hoping to attend the triennial International Council for Evangelical Theological Education (ICETE) conference in Panama this October. I attended the last ICETE meeting three years ago in Nairobi, Kenya. The connections I made with like-minded colleagues from around the world have proven valuable to my ministry as Academic Dean in many ways since then, so I am very much hoping to attend the upcoming meetings in Panama. These extraordinary expenses and more, combined with the accumulating monthly shortfall, leave us with a one-time deficit of close to $10,000. God has always provided for our needs in the past, so please join with us in praying that He will provide for our current needs as well. For family in other parts of the world, especially John and Rebecca in St. John’s.